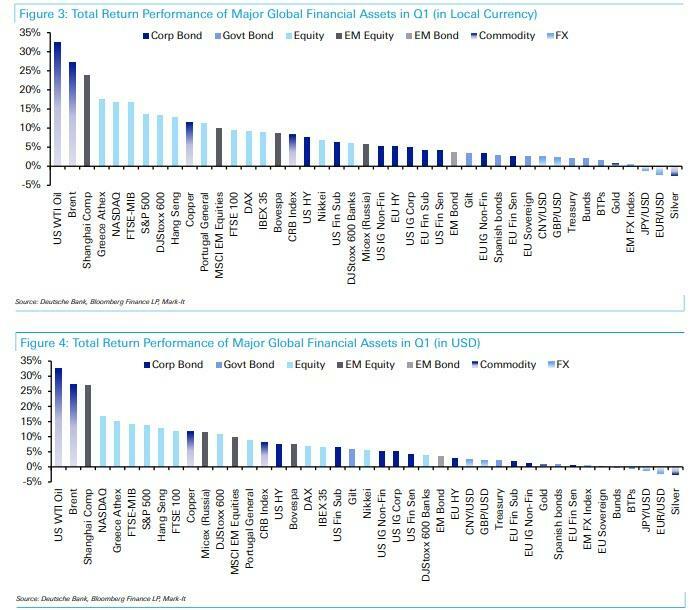 The Best And Worst Performing Assets In "One Of The Most Memorable Quarters On Record"
As DB's Craig Nicol summarizes the action in capital markets in the past three months, the first quarter of 2019 "will undoubtedly go down as one of the most memorable on record given the sheer broadness of positive total returns across asset classes." Indeed, in a far cry from the asset collapse of 2018, in the first quarter 37 out of the 38 assets in Deutsche Bank's sample finished with a positive total return in local currency terms, and 35 out of 38 assets were higher in dollar adjusted terms. A reminder that this comes after 2018 was the worst year on record for the number of assets down across the globe. For local currency returns, this matched Q3 2013 in terms of broadness and you have to go back to Q3 2010 to find the last time we had all 38 assets finish in positive territory. In addition to that, Deutsche Bank also notes that its data for all 38 assets goes back to 2007 and "we’ve never seen a stronger Q1 during this time." Picking out some of the highlights at an asset level, this was the best quarter for WTI Oil (+32.4%) and the S&P 500 (+13.6%) since Q2 2009, US HY (+7.5%) since Q4 2011, the Shanghai Comp (+23.9%) since Q4 2014 and the STOXX 600 (+13.3%) since Q1 2015. In fact there were 11 assets end Q1 with double digit returns, the most since Q1 2012. So, as Nicol notes, "it’s the scale of returns which have also been impressive, as well as the breadth." Before looking at the rest of Q1, March proved to be an eventful final month of the quarter mostly for the - at least relatively speaking - large repricing across bond markets in the last week or so following the dovish Fed meeting and the ECB downgrades. Performance for fixed income assets stood out as a result however it was still an overall decent month for equities too. 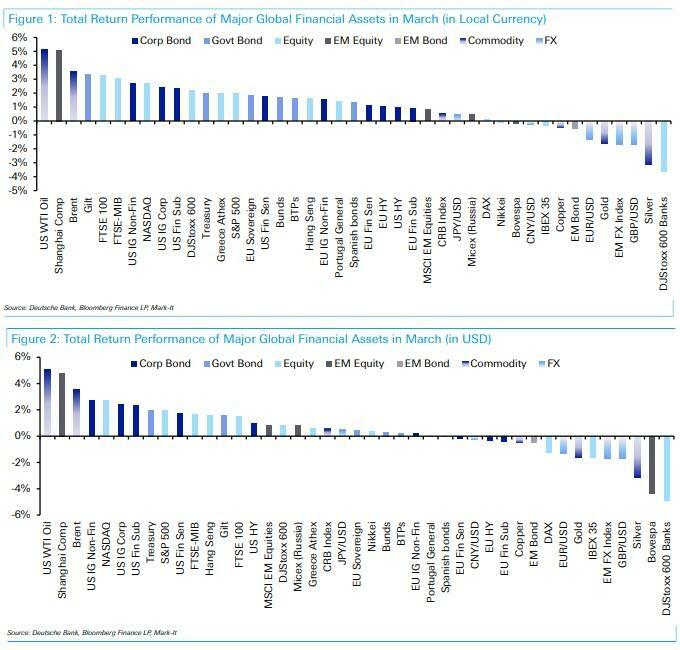 Indeed by the end of play 30 out of the 38 assets had a positive total return during March in local currency terms, while 27 did so in dollar adjusted terms. Across sovereign bond markets it was actually Gilts (+3.4%) which led the way. Treasuries (+2.0%) also posted a solid return while Bunds (+1.7%) did likewise after yields drifted into negative territory once more. The periphery, whilst underperforming, wasn’t to be outdone however with Italian (+1.6%), Portuguese (+1.4%) and Spanish (+1.3%) bond markets all still rewarding investors. Interestingly EM Bonds (-0.5%) lagged other bond markets as a few idiosyncratic stories hurt the broader asset class. The move in rates unsurprisingly helped credit markets and particularly duration sensitive rating bands with the likes of USD and EUR IG Non-Fins returning +2.7% and +1.6% respectively. That compared to returns of +1.0% for USD and EUR HY. As for equities, well the big rally for rates meant that European Banks (-3.6%) propped up the bottom of the leaderboard. That compared to a +2.2% return for the broader STOXX 600 which came despite another disappointing round of flash PMIs towards month end. The S&P 500 turned in a +1.9% return but the big winner was the Shanghai Comp (+5.1%) once again. Along with Gilts, the FTSE 100 (+3.3%) also saw an outsized gain from the Sterling move while there was an interesting divergence across Europe with the FTSE MIB (+3.0%) and Greek Athex (+2.0%) seeing gains at the expense of the DAX (+0.1%) and IBEX (-0.3%). When looking in dollar adjusted terms European equity markets tend to have underperformed the US and Asia due to the weaker Euro. Finally, in EM the MSCI EM Index returned +0.8%. As for commodities, WTI Oil (+5.1%) actually topped the leaderboard while Brent was up +3.6%. In contrast however Silver tumbled -3.1%, Gold -1.6% and Copper -0.5% which is perhaps a reaction to the broader global growth slowdown fears, while the broader commodity index was up a fairly benign +0.6%. Rounding out the rest of Q1, the one asset mentioned at the top which had a negative return was Silver (-2.4%) solely due to the drop last month. Sovereign bond markets broadly speaking are up anywhere from +1.6% (for BTPs) to +3.5% (for Gilts). Treasuries and Bunds each returned +2.1%. Credit markets returned +4.1% to +7.5% for USD and +2.8% to +5.1% for EUR with HY outperforming IG on a total return basis. As for equities, the Shanghai Comp finished with some breathing room to the next market which was the Greek Athex (+17.6%). The NASDAQ (+16.8%) and S&P 500 posted impressive returns along with the FTSE MIB (+16.7%). European Banks, despite the struggles at the end of March, still finished Q1 with a return of +6.0%. Finally, in commodities WTI Oil actually tops all markets with Copper also up +11.6%. The broader commodity index returned +8.2%.